Around this time last year, I had just a couple longer distance rides under my belt: there was a two-day jaunt from Portland to Eugene (the first and last trip done without cycling shorts), and a few all-day rides within 30 miles of the city. But I wanted to get out and explore more. Fortunately, I had Ellee Thalheimer’s Cycling Sojourner, a companion for cycling through all of Oregon’s celebrated lands – from the treasured Painted Hills to the rolling vineyards of McMinnville. With Thalheimer’s expert guidance, I was turned on to some of the greatest adventures to be had on two wheels. So on the cusp of another beautiful summer’s riding season, it was a no-brainer to again look to Ellee for guidance. And she delivers in her second installment, Cycling Sojourner: A Guide to the Best Multi-Day Tours in Washington. Through Ellee’s conversational tone, riders of all skill levels are invited to explore Washington’s renowned landmarks and varied scenery, often via use of a statewide network of rails-to-trails pathways. There is also an emphasis on enjoying the friendly charm of many of the towns that support cycle tourism throughout the state, including well-researched tips and tricks to make your journey as fun as possible. The nine rides featured in Cycling Sojourner span between 2-6 days, provide recommendations on dining and lodging to fit any rider’s budget, and offer options for riding throughout the year. 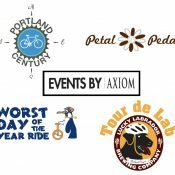 Based on my previous rides, Ellee’s recommendations for dining and lodging are spot-on. She gives preference to proprietors that are friendly towards people who arrive by bike, or that offer something a little off-kilter and cater to riders looking for gluten-free, organic, or vegan options. Thalheimer kickstarts this edition with a Taste of Touring, starting right in Seattle’s center, hugging Lake Washington to Bothell, meandering through Redmond and Carnation before linking up with trails all the way back in about 78 miles. Even for the adventurous beginner, the rides are split in two segments, making for an easy one-day stint. From there, Ellee provides other options: even on the Epic Washington Ride (250 miles, with a difficulty rating of 7/10, and massive climbs), the beginner can ride as little as 23 miles in a day and still get huge rewards like high alpine crystal lakes that look like a scene from the mountains of Central America. However, intermediate and experienced riders can also choose from a number of trips, including: island-hopping in the San Juans; mountain scaling in the Olympic Peninsula; and roller-coasting wheat fields, hop farms, and vineyards in eastern Washington. The geographic variety gives you year-round escapes even when it’s pouring along the I-5 corridor. One of Thalheimer’s greater contributions as a knowledgeable tour guide is her attention to the regional culture. Each chapter contains a unique history, including an 11-year war; its only casualty a pig. We’re also educated about the past advocacy and ongoing efforts to preserve these wild and scenic areas for future recreationists. In addition to the dining and lodging recommendations, the book also highlights art galleries, bike shops, museums, swimming holes, and other points of interest to make your journey complete: getting you off the saddle and enjoying a holistic experience of these destinations. 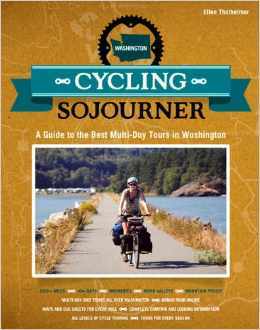 Cycling Sojourner provides comprehensive logistics while cramming in insightful tips, and teases tantalizing temptations like descents that make your eyes water, snow-capped mountains with clear lakes, sightings of whales, bald eagles, and cougars, serenely quiet valleys, and miles upon miles to connect yourself to the environment and communities that await you. 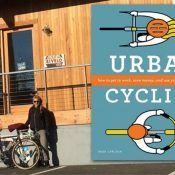 — Ellee’s new book can be pre-ordered for $18.95 at CyclingSojourner.com. Gah! Don’t tease me! I funded the kickstarter and am expecting my copy any day now!